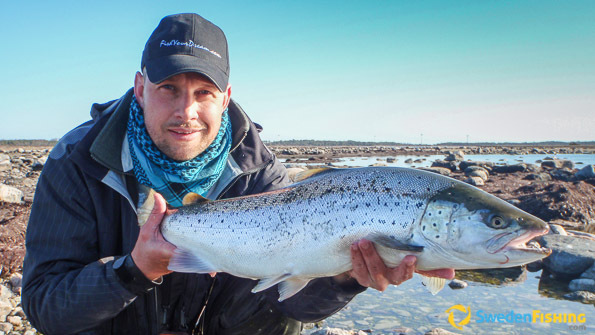 Join us for fishing in some of Swedens best areas for ocean trout. But FishYourDream gives you more than just that. Keeping the environmental impact of our business in mind, we make sure that food, accommodation and service receive the same attention as the time spent fishing. You fish undisturbed on the pristine Gotland banks with more than 800 km of shoreline at your disposal. Our fishing guides have many years of experience fishing in our waters. At Fish Your Dream we speak Swedish & English. Year-round, peaking from March 15 to May 15 and between October 15 - December 1. 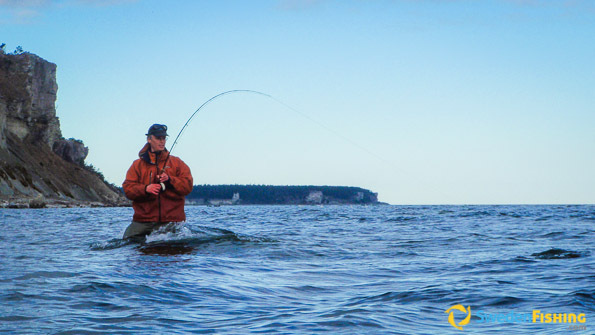 With cool water the fishing can be good all day, but during late spring, summer and early fall you should focus your efforts on early mornings and evenings/nights. Bird watching, botany tours, riding, golf, guided tours, Medieval World Heritage city of Visby. We welcome all anglers to our beautiful island and it´s great fishing! Main target: Searun brown trout (Salmo trutta), average weight about 5 lbs, but specimens around 18 lbs are caught every year. Lengths up to 90 cm+. Additional species: pike, cod, perch, flatfish and garfish. Fishing guides, accommodation (cabins, hotels, hostel), equipment, food, rental cars, transfers. Fishing is shore based, so waders are a must. Traditional coast-style spinning gear with a rather soft 9-10 foot rod and a spinning reel with braided line (0.13-0.18) covers most situations. You can also choose to fight elusive trout with fly rod, thus maximizing your contact with the fish, a perfect choice when the water is colder. A 9 rod, class seven or eight, with a reel that holds a lot of backing is called for. Ocean trout minimum size: 50 cm. Release all fish that have just spawned, called kilts in Swedish. All streams are off limits, as protected sectors during the period Oct 1 - Dec 31. Northern pike min/max size 40-75cm in the Baltic. Pike and Perch prohibited March 1 - May 31. // Visby Youth Hostel // At the youth hostel you have fishing, service and the enchantment of Visby close at hand. It is no more than a five minute walk to superb trout fishing and just as close to the evening’s dinner, unless you want to cook it yourself in our kitchen. The eight rooms share three showers and toilets. On street level you find Gotland Active Store where you buy fishing equipment and find out about Gotland activities. // Cabins // Two truly high-quality cabins 700 metres from the Baltic Sea. 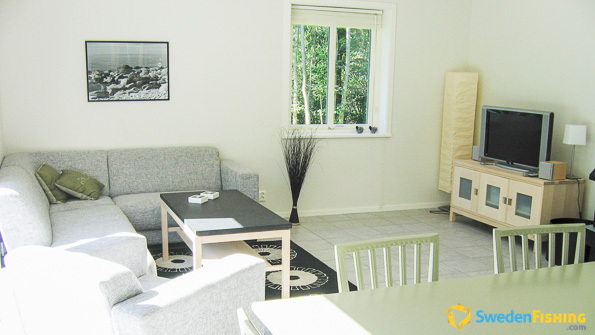 These 70 m2, 6-bed cabins located about 700 metres from fishing have 4 rooms and a kitchen. Here your fishing day begins and ends in the most comfortable way. We also have three 4-bed cabins of about 40 m2, located about 150 metres from good fishing spots. All cabins offer spin or fly-fishing. Cabins are about 15 km from Visby. We can also book your stay at a hotel if you wish. Gotland Island, east of Sweden´s mainland, is the country´s largest island. Flights available from Arlanda (ARN) and Bromma (BMA) in Stockholm. (Car)ferry from Nynäshamn or Oskarshamn south of Stockholm. Ferry: www.destinationgotland.se Air: www.gotlandsflyg.se Air: www.skyways.se.